Goa CM Manohar Parrikar's demise ahead of the General Elections does not augur well for NDA. Goa Cheif Minister Manohar Parrikar passed away on Sunday evening aged 63 after battling with cancer. The humble former defence minister passed away after battling pancreatic cancer for a long time. The exemplary leader was a man who donned many hats during his illustrious political career. The world condoled the death of the mass leader, so did the cricket fraternity. Virender Sehwag and VVS Laxman were among the first to offer condolences. 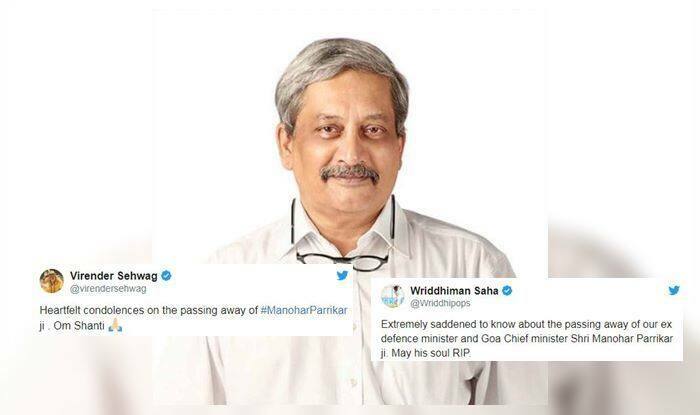 “Heartfelt condolences on the passing away of #ManoharParrikar ji. Om Shanti,” posted Sehwag minutes after the news broke on TV. Parrikar was extremely popular among the people who knew him for his humble self. His loss creates a huge vacuum in Goa. The IIT graduate started out his political career as a Pracharak of the Rashtriya Swayamsevak Sangh (RSS) and then he went on to become the defence minister of the country. IIT Bombay released a statement condoling the death of Parrikar.